“I was truly honored and humbled by this award.” What a rewarding feeling to love what you do and win awards for it. We are very grateful. 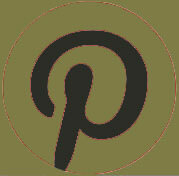 We recently posted the above picture on our facebook page, and we got lots of feedback about it. Some talked about how much they loved the style, and others were surprised that we could make something that wasn’t a technical “cabinet”. So let us assure you, if it can be made with wood, we can make it. So let’s talk about desks—and more broadly, home offices. In this economy, many people have moved their offices into their homes. Great idea! How’s your organization? The same rules apply in a home office as in a work office. You need a proper area to work and organize your material. Maybe you need a modest desk, like the one above. 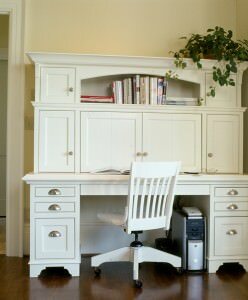 Or maybe you need a desk that takes up most of a wall, and includes nooks for organizational baskets, notebooks, a vinyl corkboard, file cabinets and a pop-up computer monitor. Or maybe you need something in between. desks like this at office or big-box stores). 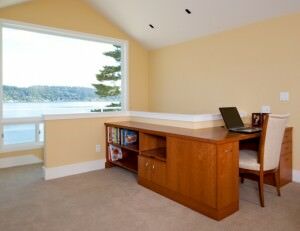 Let us help you design a home office that will not only add value to your home, but will help your business run smoother as well. So you’ve been itching to know what Adrian’s favorite veneers are. 🙂 Enjoy this short video where he talks about 2 of his favorites. Veneer is a thin slice of wood that gets glued to some sort of sub-straight to create the various plywoods and architectural panels that are used in every day applications. At Vision Woodworks, we have the advantage of picking out flitches (large blocks of wood cut from a log which then get sliced into “leaves”) to get the grain pattern and color tones we’re after. Since it all comes from one block of wood, there is consistency. This is as opposed to off-the-shelf products where the veneer can be sourced from completely different trees from sheet to sheet. Book matched: the “leaves” are folded open like a book for a mirror image. Book matched tends to lend itself more to a traditional look. Slip matched: “leaves” are placed in a subsequent repeating pattern. Slip matched tends to lend itself more to a modern look. Stability: The beauty of veneers is that you can do what you can’t with raw lumber. 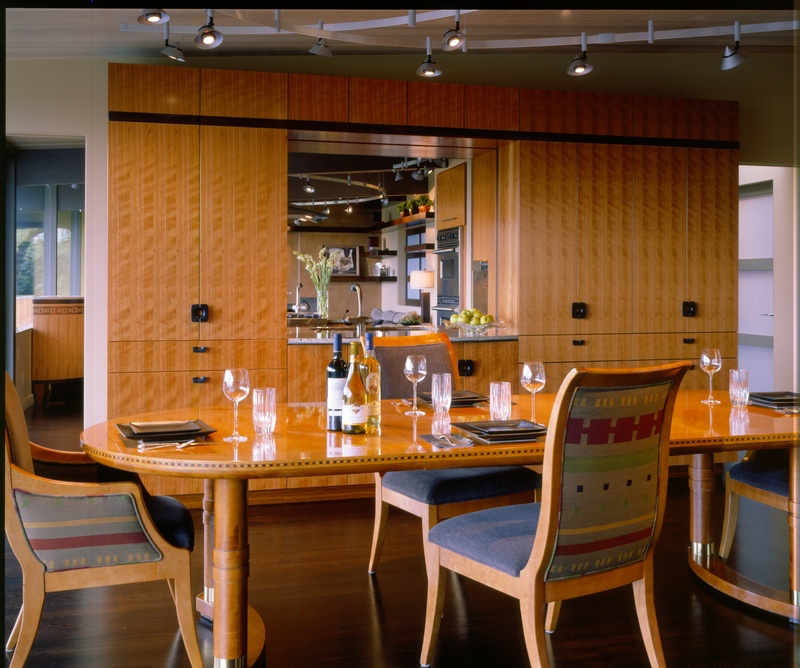 Veneered panels tend to be a lot more stable (less movement) from a solid wood panel. 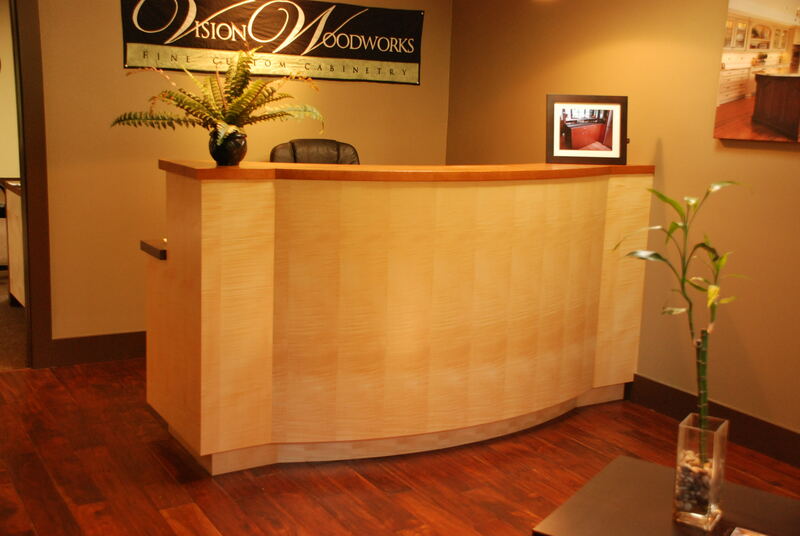 Maximum Use: Veneer allows you to get a lot more square footage of viewable area from a smaller piece of wood, thus maximizing use of a beautiful piece of wood. Availability: Some cuts and exquisite grain patterns of wood are only available in veneer form and not in solid form. What are some of Adrian’s favorite veneers to work with? Some of Adrian’s favorites are English sycamore, quartered cherry, wenge, and sapele pomelle, to name a few . Enjoy these short videos that further explain veneers. 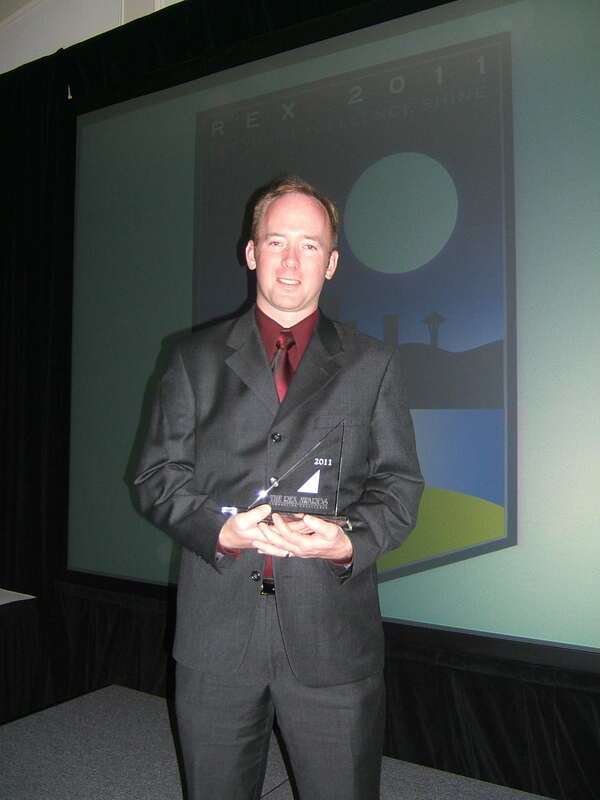 Vision Woodworks, Inc is excited to announce that yet another of its projects has won a REX award. 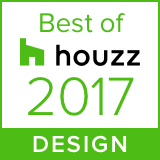 It was announced in June that the Redmond project won in the “Kitchens More Than $175,000” category. 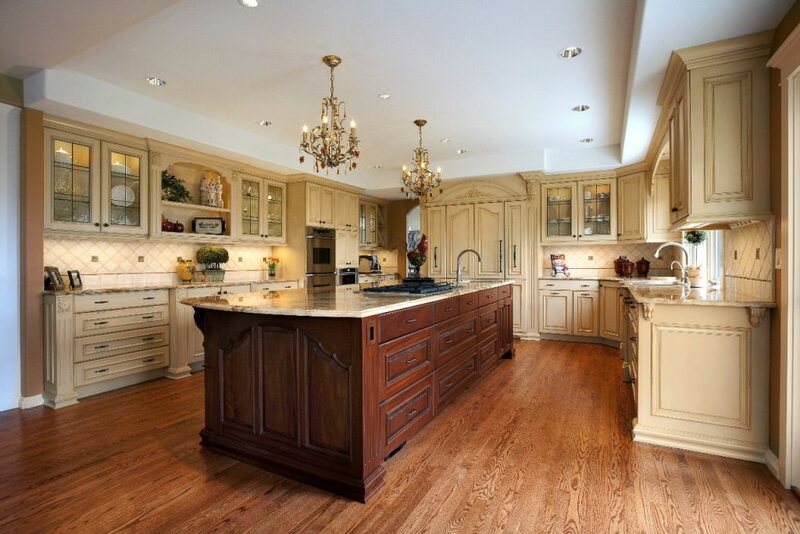 In this breathtaking kitchen, glazed finished upper and lower cabinets stand as a backdrop to an elegant mahogany island with French curves. It is no wonder it won a BIAW (Building Industry Association of Washington) award in 2009, and a REX (Remodeling Excellence) award in 2010 from the Master Builders Association. A big thank you to Singleton Construction for coordinating this project.